It's the most advanced medical grade chemical peel available & now at SKIN the Spa at Runnels Center. Get amazing results with The Perfect Derma Peel, the most advanced medical grade peel available. The perfect treatment for sun damage, fine lines, wrinkles, acne, enlarged pores, and hyperpigmentation including Melasma. You can see a difference after one treatment! ...And the results are appealing, too! 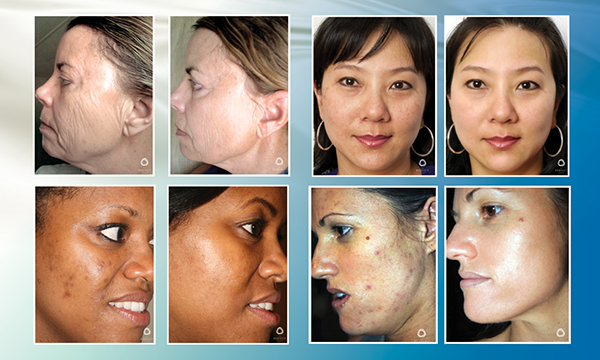 The Before and Afters show the dramatic & amazing results of The Perfect Derma Peel! The Perfect Derma Peel is a safe and effective, non-invasive chemical peel that is virtually painless, and offers an easy and consistent peeling process. It's great for all skin types and ethnicities. The Perfect Derma Peel is made of powerful ingredients such as Vitamin C, Retinoic, Salicylic & Kojic Acids. And it's the only chemical peel with Glutathione, which brightens skin, slows the aging process, and helps prevent wrinkles. A much higher concentrated blend of ingredients that gives amazing results for very oily or resilient skin and highly effective for stubborn hyper pigmentation such as melasma, acne scars, actinic keratosis and sun damage to the face, hands, arms, chest and back. Benzoyl Peroxide and Hydrocortisone are added to the same synergistic Perfect Peel ingredient blend to provide enhanced results for those with moderate to severe acne and related scarring.